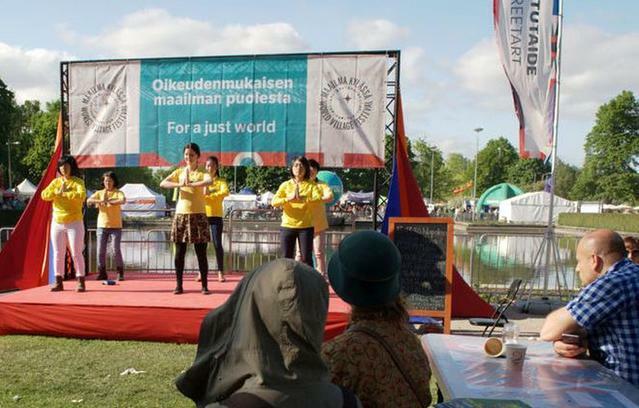 Falun Gong was invited to participate in Helsinki, Finland's annual World Village Festival on May 28 and 29. The theme of this year's festival was “Justice”. More than 80,000 people attended. The Falun Gong group introduced the practice and raised awareness about the persecution in China. They hosted a showing of the award-winning documentary Human Harvest, detailing state-sanctioned organ harvesting atrocities from Falun Gong prisoners of conscience. The exercise demonstration attracted a lot of attention. As they observed the beautiful exercises, they were surprised to learn about the brutal persecution in China, especially the organ harvesting atrocities. People lined up to sign a petition calling for an end to the persecution. 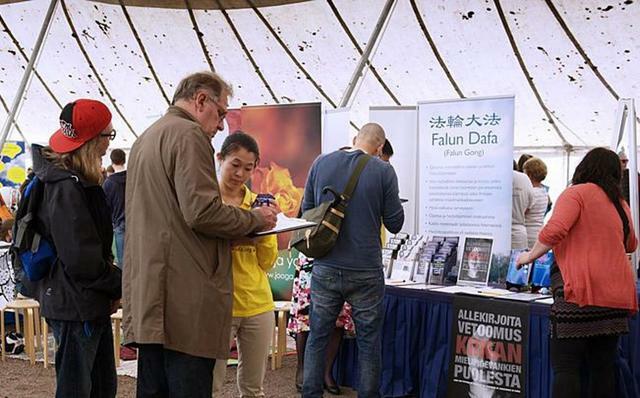 A lady and her friend asked, “I don't understand why the Party would persecute Falun Gong.” The practitioner responded to the lady in Finnish, and the lady said, “My friend here speaks English. Could you tell us again in English so that she will know too?” The woman also asked her husband to come and listen. Jane, a college student, said, “The persecution is terrible! So evil! We have to stop it together!” She sign her name on the petition and wanted to learn Falun Gong. The award-winning documentary Human Harvest was screened on the evening of May 28 with a discussion following. The topic of discussion was “Absolute Evil– Why It Is Going on and What We Can Do”. Mr. Thomas Elfgren, an expert on international investigations, Mr. Olli Törmä, Chairman of the Finland chapter of Supporting Human Rights in China, Ms. Anu Tuukkanen, officer of Amnesty International, and Falun Gong practitioners who have personally experienced the persecution in China, gave talks during the discussion. The audience gave very supportive feedback, signed a petition, and called for the Finnish Parliament to help stop the persecution. More people signed the petition through social media on the next day. A student named Elias Outakivi made an eight-minute-long documentary on Falun Gong as a class project, and played it on another booth during the World Village Festival.